Above schematic design is an isolated feedback SMPS (switched mode power supply) circuit using the isolated feedback capabilities of the TL3103 for both current and voltage sensing. This powersupply is powered from the AC mains and has an output of 5V DC at 1.5A. Both output voltage and current are sensed and the error voltages are applied to the error amplifiers of the TL594 PWM control IC. The 24V transformer has the output about 35V at the 1000uF filter capacitor (electrolytic). The 20-kHz switching frequency is set by the 6K Ohm resistor and the 0.01uF capacitor on pins 6 and 5, respectively. The integrated circuit TL594 is set for push-pull operation by tying pin 13 high. The 5V reference on pin 14 is tied to pin 15, which is the reference or the current error amplifier. The 5V reference is also tied to pin 2 which is the reference for the output voltage error amplifier. The output voltage and current limit are set by adjustment of the 10K Ohm potensiometer in the TL3103 error sensing circuits. A pair of TIP31E NPN transistors are used as switching transistors in a push-pull circuit. 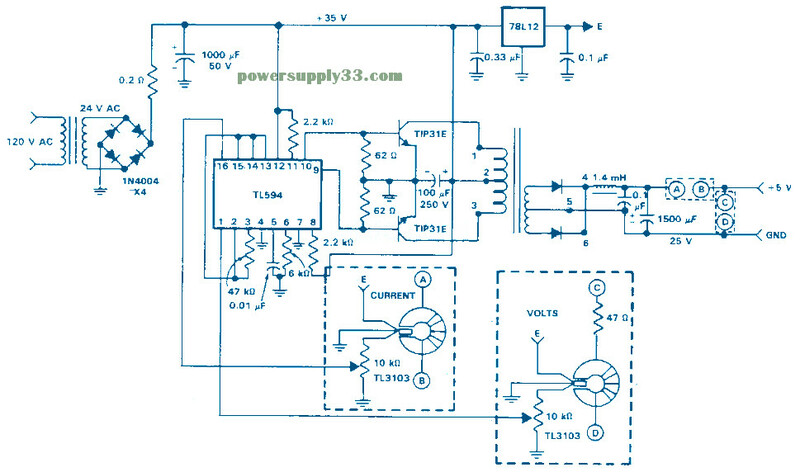 Switched mode power supply incorporates a switching regulator to convert electrical power efficiently. Like other power supplies, an SMPS transfers power from a source, like mains power, to a load, such as a personal computer, while converting voltage and current characteristics. Unlike a linear power supply, the pass transistor of a switching-mode supply continually switches between low-dissipation, full-on and full-off states, and spends very little time in the high dissipation transitions, which minimizes wasted energy. Ideally, a switched-mode power supply dissipates no power. Voltage regulation is achieved by varying the ratio of on-to-off time. Related Post "Isolated Feedback SMPS 5VDC 1.5A"